Perhaps the business that gained most support and priority in UAE is the real estate sector. The high rise buildings and infrastructures for entertainment, tourism and other purposes clearly reveal the opportunities available in the country for builders and entrepreneurs related to real estate business. Since past several decades, UAE is providing lucrative and continuous business prospects to investors, developers, brokers and construction companies. There are several such companies and entrepreneurs that are taking advantage of these opportunities since long, while there is a continuous influx of foreign investors in the UAE real estate sector. The opportunities for setting up any business related to real estate in UAE are numerous and the registration process is not very tough one either. But the main issue for any new business in any such crowded area is the competition. They have to compete against already established businesses and this is an extremely difficult situation especially for small entrepreneurs and investors. In the absence of large capital for aggressive marketing campaign, presenting their business to their potential clients is a serious headache for them. But the government of UAE doesn’t leave the investors or entrepreneurs after they establish their business, and they provide complete assistance to them also to flourish their business. A simple and cost effective measure that any new (and also established) entrepreneur with small investment can take to grow his business in UAE is by using various big malls in the country. Several local and multinational companies have setup their malls in all the big cities of UAE. These malls are regularly visited by wealthy local and expat population. Apart from that, millions of tourists also visit the beautiful country for various reasons every year. Many among them would want to choose UAE as their residence place due to world class (health, education etc.) services available here along with the peace and (political and economic) stability prevailing in the country that may not be possible even in several developed western countries. In this case, these malls provide amazing opportunities for developers and construction companies to market their services to their potential clients. These entrepreneurs and companies related to real estate sector can easily do so by setting up real estate kiosks in these malls. This practice is allowed and regularize in UAE. Initially, the permission is required from the administration of mall. The kiosk will be charged after considering various factors (size of mall, number of visitors, space taken by kiosk etc.). In the next step, permission from the related government authority will be taken. There are different authorities that handle this business activity in various emirates. Dubai DED (Department of Economic Development) is the authority in Dubai for setting up kiosks in Dubai, while other emirates have their own departments. 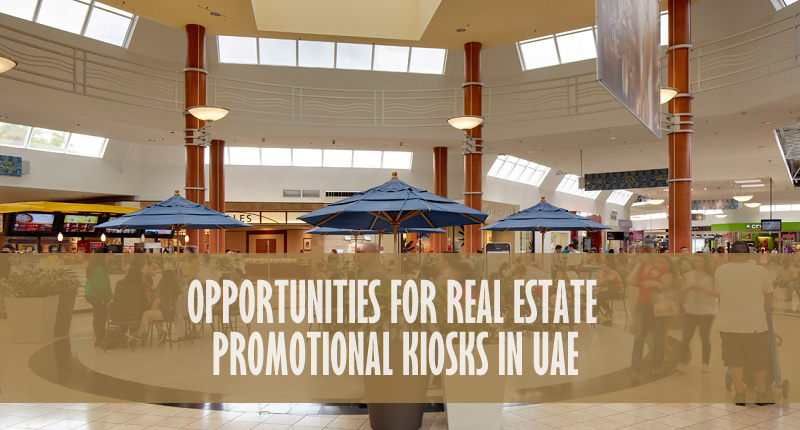 If you want to setup real estate promotional kiosk in any mall in the UAE, then the simplest way to do so is by contacting Riz & Mona Consultancy via our WhatsApp # 971-56-9971225. We will provide you complete and comprehensive assistance in this matter. UAE has got lot of opportunities in real estate sector and it will grow still bigger and faster. Thanks for giving these details in the article.